Virgin Voyages continues to post and release new teases of Scarlet Lady, the first ever Virgin cruise ship. We’ve been treated with a shiny new look at the beach club venue. A new rendering video posted by Virgin Voyages shows us the beach club venue located aft of the ship. This chilled out club is named “The Dock” and is an area which offers guests stunning ocean views and ways to relax. Virgin previously released a rendering image of the area but this is the first time we get to see a video. The Dock, our beach-club inspired space at the aft of our ship was born from the minds behind Roman & Williams. Treat yourself to ocean views, two bars, and an array of carts full of Mediterranean inspired plates. What's not to love? The Dock which has been visioned by the minds behind Roman & Williams features two bars and an array of carts full of Mediterranean inspired plates. There will be lush loungers and natural decor which compliment all those stunning sunsets from the very aft of the ship. Virgin Voyages is constantly releasing new details about Scarlet Lady which is currently under construction at the Fincantieri shipyard in Genoa, Italy. The adults-only vessel will arrive in 2020 as the first ship in the fleet and starting a new era for the cruise line which is based in Fort Lauderdale. The cruise line has already recently released details on dining venues which will be free. The ship won’t be featuring the traditional buffet and dining room experience on most other cruise lines. Scarlet Lady will also have a Tattoo Studio at sea along with tons of new teases which you can go through here. 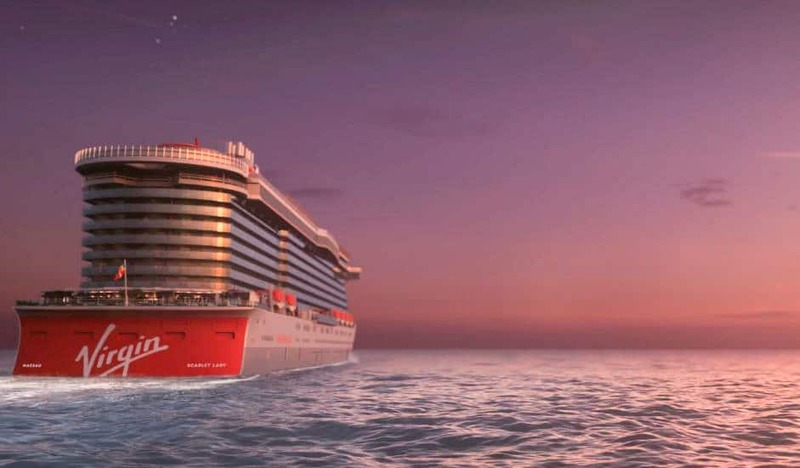 Once completed Scarlet Lady will be 110,000 gross tons and have a guest capacity of 2,700. The ship will be based out of PortMiami, Florida and sail week-long Caribbean cruises. We already know select itineraries will feature an overnight call in Havana, Cuba. Keep a lookout for more details in the coming months about the first ever Virgin cruise ship.